Reply headed 'Mr [Edward] Burrow Port Glasgow'. Advice and a recipe for Mrs Burrow whose menstruation, always difficult, has been delayed by a fright. Cullen gives an emmenagogue recipe in plain English, which he admits is unusual, but is done from his regard for the family. 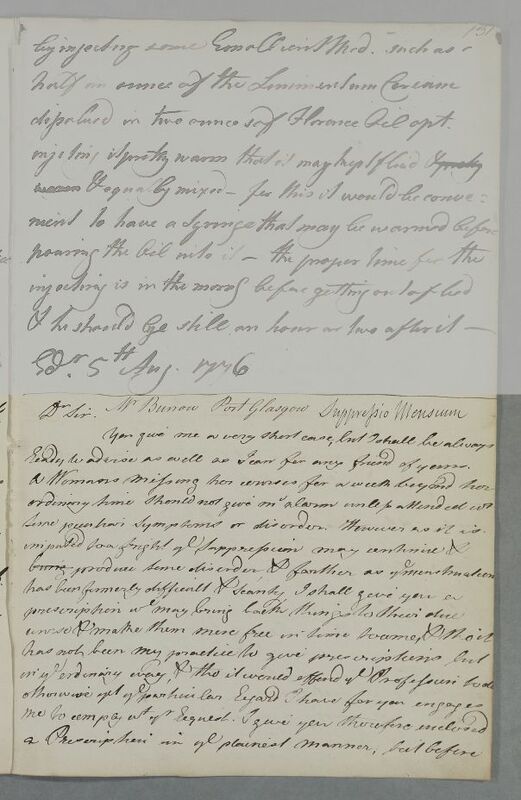 He asks Mr Burrow to have it transcribed, so that the apothecary does not recognise Cullen's hand. 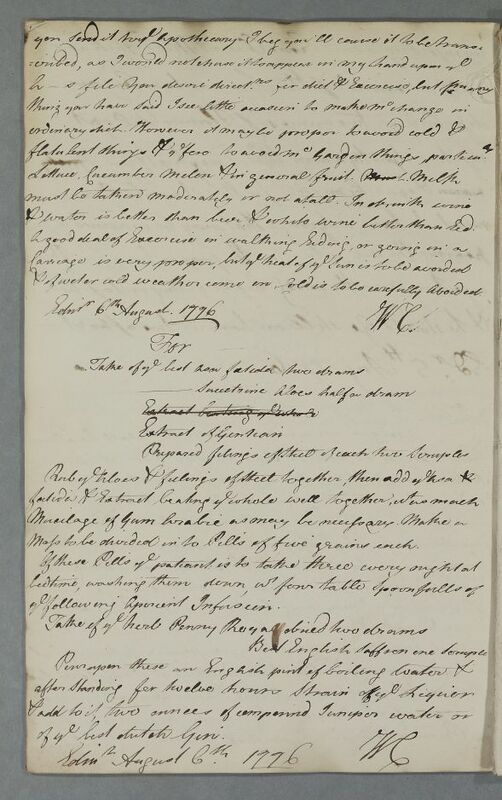 Summary Reply headed 'Mr [Edward] Burrow Port Glasgow'. Advice and a recipe for Mrs Burrow whose menstruation, always difficult, has been delayed by a fright. Cullen gives an emmenagogue recipe in plain English, which he admits is unusual, but is done from his regard for the family. He asks Mr Burrow to have it transcribed, so that the apothecary does not recognise Cullen's hand. Case of Mrs Anne Burrow [Burrows] being treated for vomiting and severe abdominal pains. Case of an unnamed female patient, a friend of Mr Edward Burrow at Port Glasgow. ready to advise as well as I can for any friend of yours. & water is better than beer, & white wine better than red. & if wet or cold weather come on, cold is to be carefully avoided. Mass to be divided in to Pills of five grains each. of the best dutch Gin. 1: Cullen is anxious not to be exposed for the professional indiscretion of writing out a prescription in English. of ye best dutch Gin.